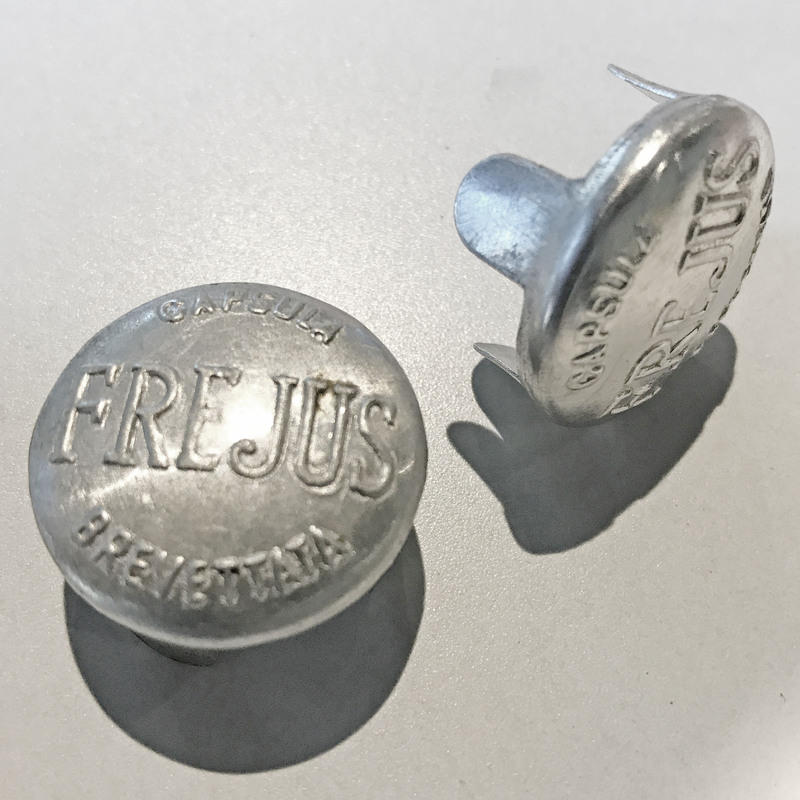 Frejus is one of the big historic Italian brands that was founded by Emmo Gelfi in 1896 and acquired by Emilio Bozzi S.p.A. in 1946, joining the Legnano and Wolsit brands and production. The Campione del Mondo was the top road model for Frejus having won 11 World Championships and counting by 1958. 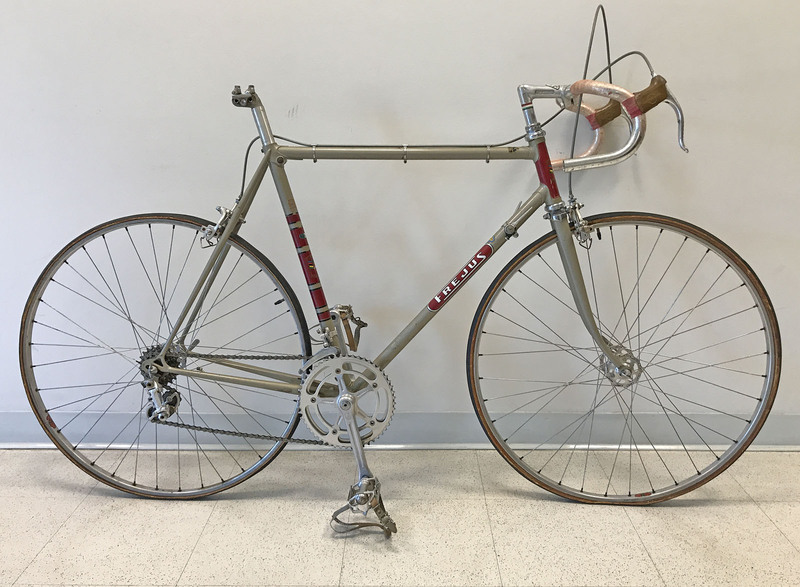 This 1972 bike in the classic team colours and original factory finish was just purchased (September 2017) from its original owner via Yellow Jersey Inc, a bike shop that has been operating in Arlington, Wisconsin since 1971. 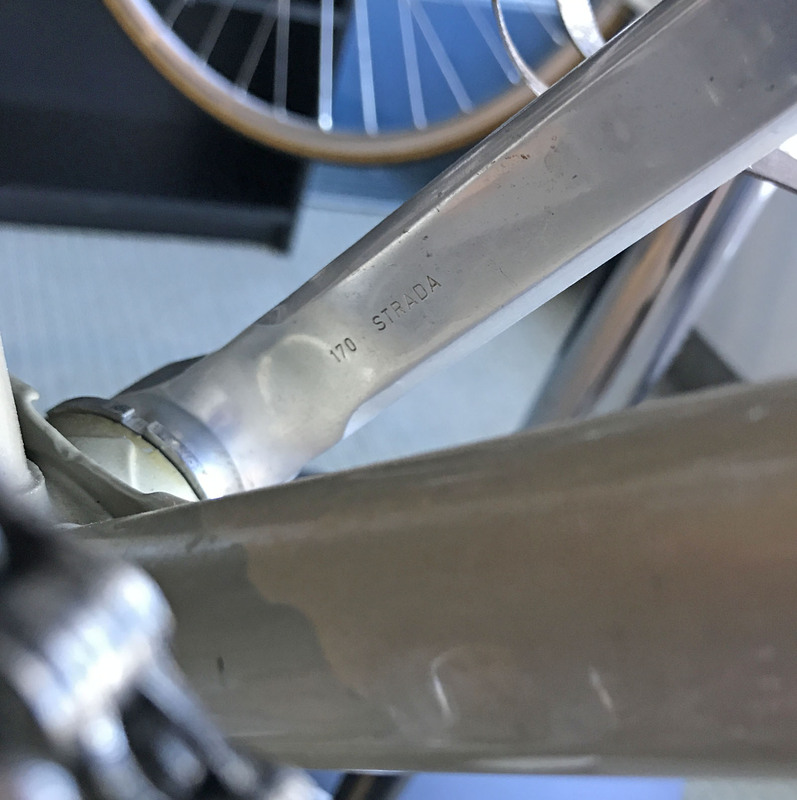 During my years of researching and collecting Legnano bikes, I have come across several early 70’s Frejus bikes that were built using the unique Legnano seat lug with the seat post bolt below the top tube and ahead of the seat tube. At first I thought these exceptions where Legnano Roma models that had been refinished in Legnano trim. However I also came across other examples that still had their original factory paint and decals, as does is this one. In addition, the fork crown on this Frejus is also the same fork crown used on the Legnano Roma at this time. There is always a good deal of anticipation when the Fedex man arrives with a new addition to the collection. After unpacking the bike and a quick assembly, I was more than pleased with what the online listing photos had promised. In particular the original factory paint is in excellent condition and there is no need for a respray although once it is fully dismantled and cleaned up, I may have Velocolour apply a light polyurethane clear coat to bring back some of the original lustre and protect the original decals from further deterioration. Although it is getting harder to find one-owner bikes these days, I had a good sense that the claim was true for this Frejus. 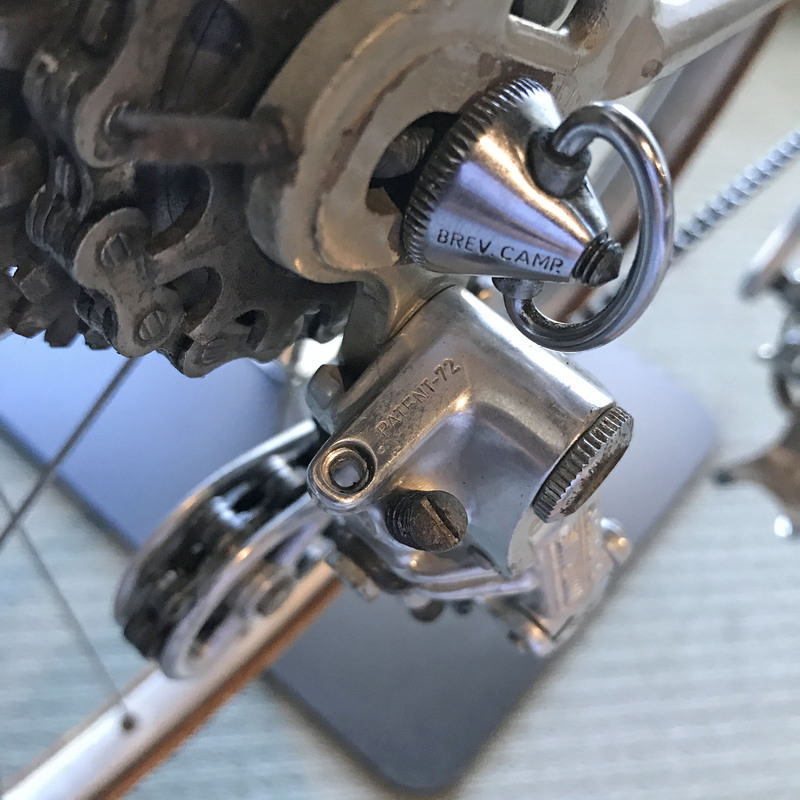 And by all accounts the component build was factory correct with the exception of the Universal Mod.61 centerpull brakes that had been replaced with first-generation Dura-Ace sidepulls. These Dura-Ace brakes will go into the parts bin or back on to eBay and fortunately I have a set of the correct Universal Mod.61 centerpull brakes to make the correction. I have also managed to source a Brooks Professional saddle in excellent condition that has the snub nose design of the era. Legnano and Frejus bikes constructed with Reynolds 531 tubes began in the late 60s, early 70s on each of their top road models and they have become increasingly collectable, particularly those bikes that were built through to about 1972/1973 with the unique Legnano seat lug and binder bolt under the top tube and in front of the seat tube. And from what I have been able to determine, these early 70’s Legnano and Frejus Reynolds builds are identical in all respects and most likely made their way through the Bozzi factory that way until they hit the paint line where their branding was determined. Everything about that frame finishing, decals, detailing and construction confirms the 1972 production year and the original Campagnolo components support that dating including the rear Nuovo Record derailleur, the 170mm Nuovo Record Strada crankset that was not date stamped by Campagnolo until 1973, and the matching 72 date stamps on the Campagnolo Record high flange hubs shown in the last two photos below. That said, never rely solely on components alone to fix a production date as they could well have been changed up over the years and are sometimes used by deceitful resellers. Here are few more photos of the bike’s components. 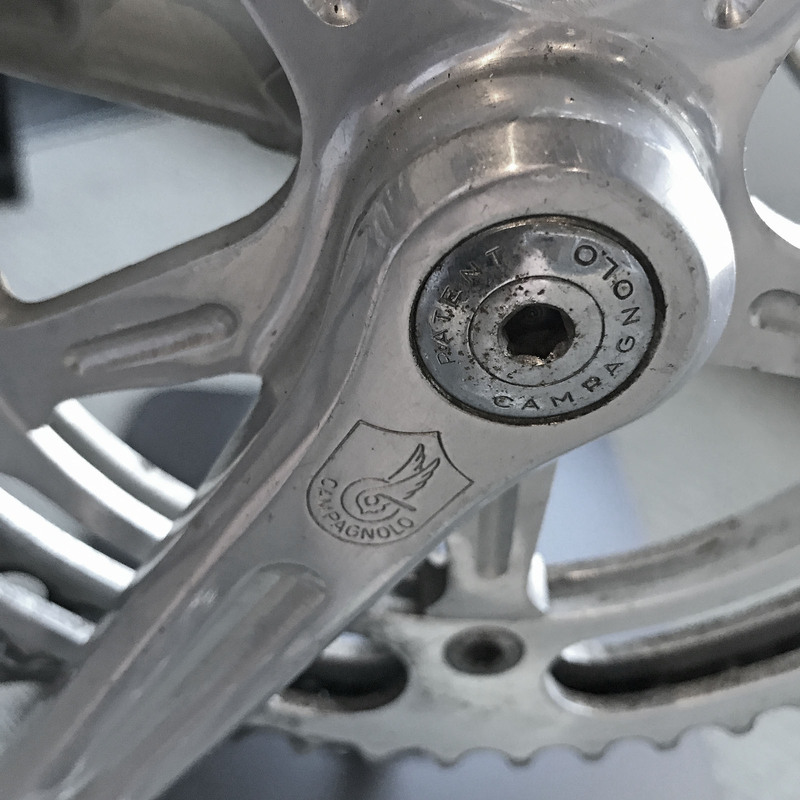 The Campagnolo Nuovo Record Strada cranks are fitted with 52/49T chainrings, the classic Italian ‘half-step’ gearing of the 1950’s and 1960’s that was in it’s final days by the early 1970’s. 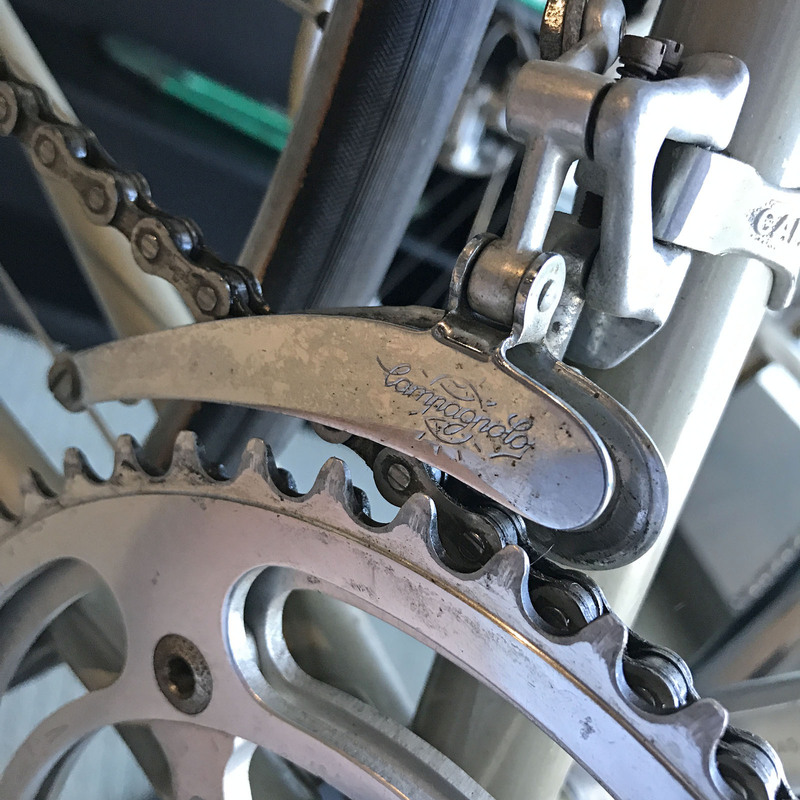 Looking at the condition of the teeth on the chainrings, this bike has not seen a lot of road time over the past 45 years. 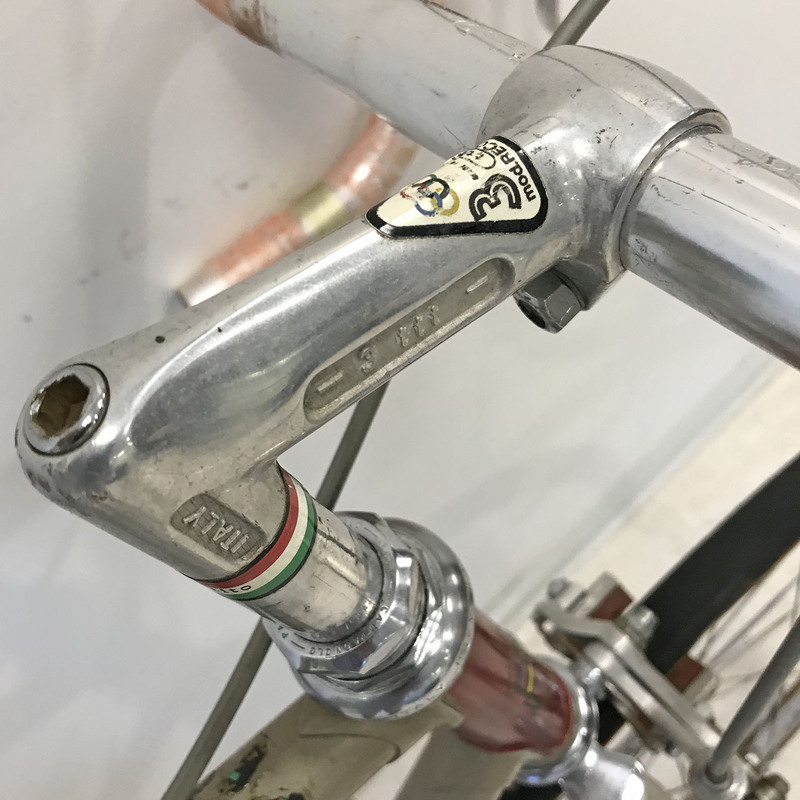 Although the elegant Cinelli 1A alloy stem was in production, this 3TTT forged alloy stem and bars were often the de facto spec on top Italian road bikes at this time with proven performance and also less expensive than the Cinelli masterpiece. This Frejus was sporting some 70s Japanese hubs and rims in the sales photos along with the original factory wheels with Campagnolo Record high flange hubs and Fiamme tubular rims. 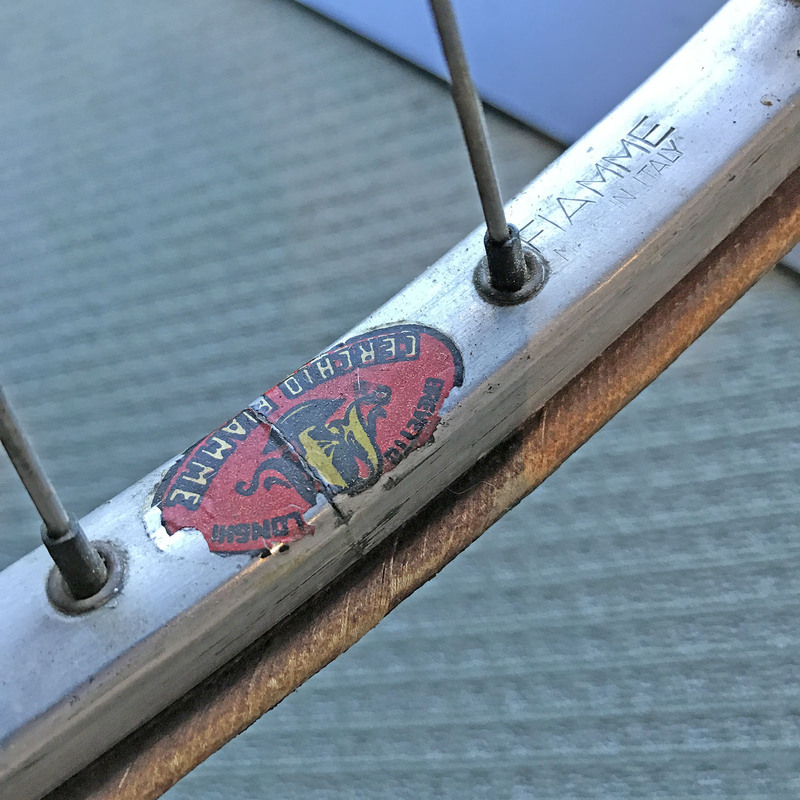 Based on the lack of rim wear, the original owner must have made the switch not long after first buying the bike as like many non-competitive riders they did not like the relatively high cost at that time of tubular tires and the glue mount process that was not familiar to them. 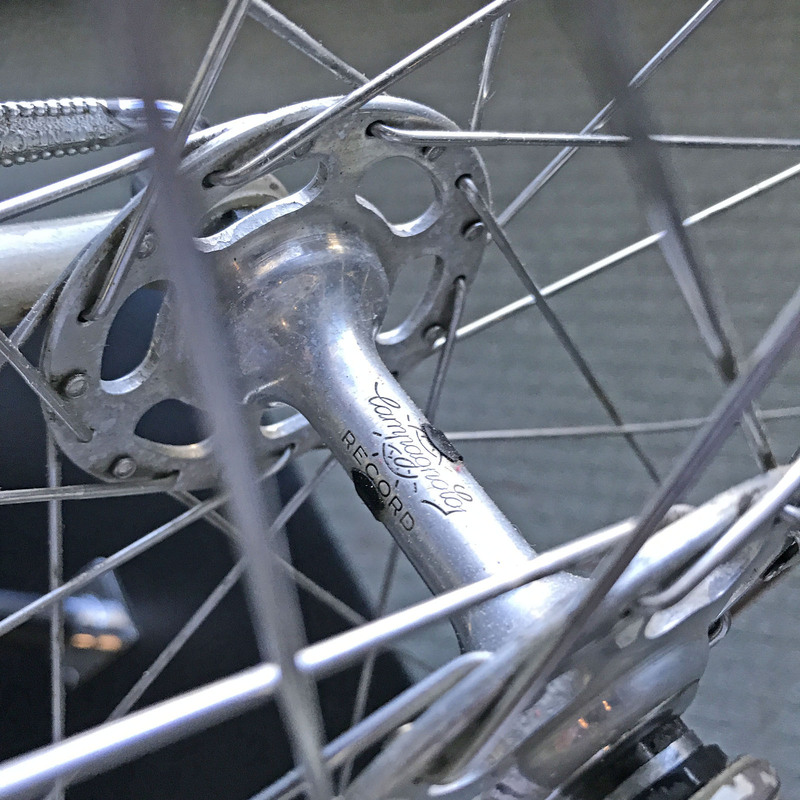 Usually the original tubular wheels are long since gone in a swap meet or garage sale, so it was a real bonus that they had been kept with this bike and they are in such good condition they will not need to be rebuilt. 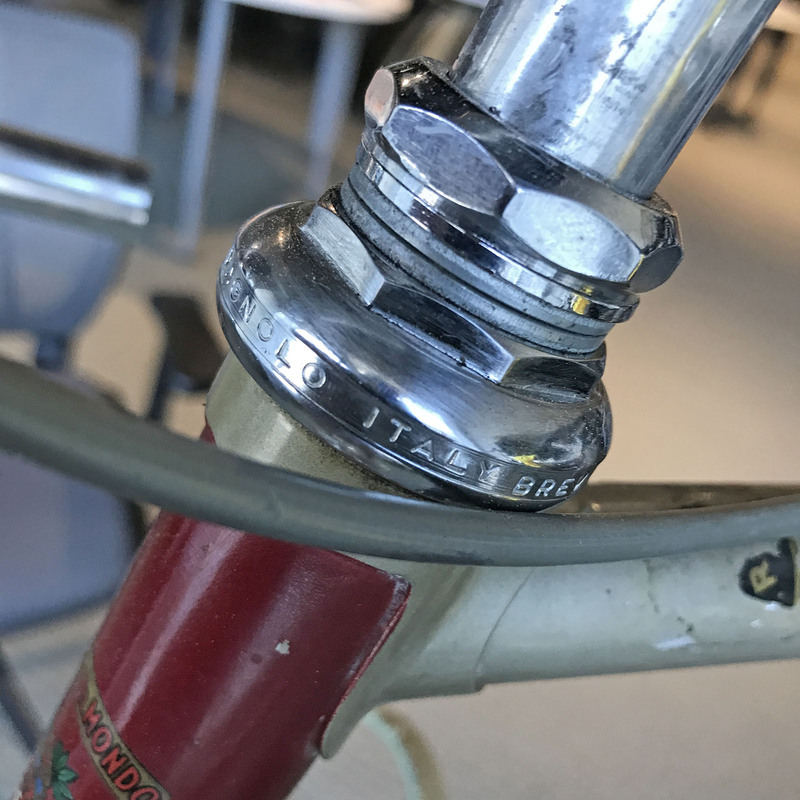 Given the crazy prices for a NOS Campagnolo headset, or one in good condition, I am glad the original owner or their shop mechanic used the proper tools when servicing the bike. 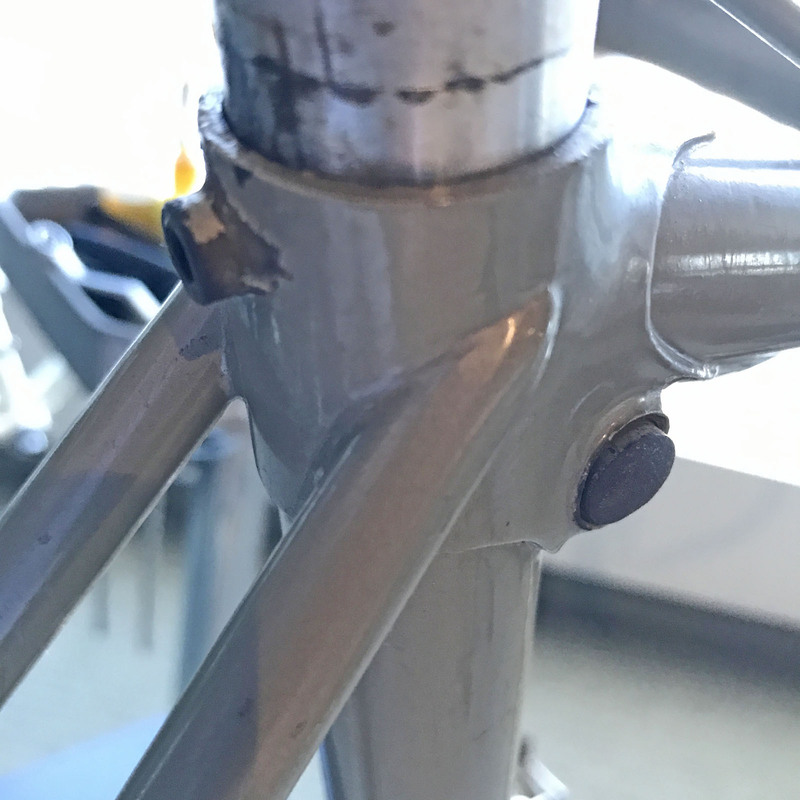 The two non-Campy spacers are taking up the slack for the front brake cable hanger/stop that was removed when the Dura-Ace brakeset replaced the original Universal Mod.61 centerpull brakes. The mounting boss on the rear of the seat lug was used by both Legnano and Frejus at this time to mount the cable hanger/stop for the Universal Mod.61 rear centerpull brake. The cable hanger/stop for the Universal Mod.61 brakes was unique to Emilio Bozzi SpA to work in conjunction with their unique seat lug and binder bolt format. These cable hangers are becoming increasingly difficult to source, so if you have one in your parts bin don’t chuck it. Lastly, a pair of NOS Gaslo handlebar end caps that have been waiting patiently in the parts bin for this project to come along. 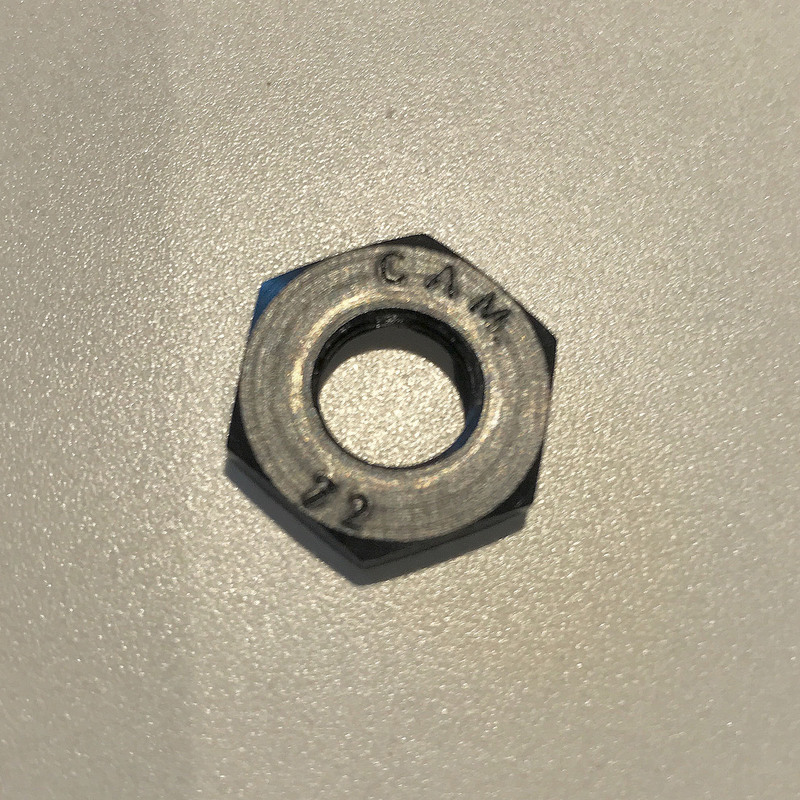 These aluminium end caps were branded for Legnano, Frejus, Bianchi and a few other classic Italian brands through to the early 1970’s and they are fetching crazy prices these days when they do come available. There is not much more to say about this Frejus until I get into the ‘light’ restoration of this wonderful bike, which I will save for the cold winter months here in Canada that are not too far off.